Working: Hey, Linden Lab, Mainland Needs More Crust! I looked and looked and looked but I just could not find the giant graffiti sign that said "Torley was here - LULZ!" I really enjoy cruising the grid in my tall ship. 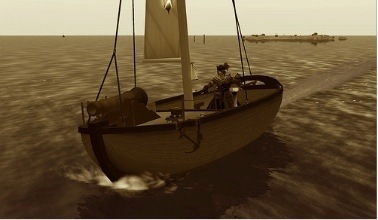 I have a fleet of them more or less, but sometimes I really like to take-out my gunboat. The prim build is stunning and it certainly is one of those joyful-surprises, quality-wise. Among the (very few) best purchases I have made in three years. Yes, there is the Blake Sea, but the problem with the Blake Sea is that the entire area is a no-rez zone, save for little square parcels slat-and-peppered through-out where you can rez your boat and off you go. 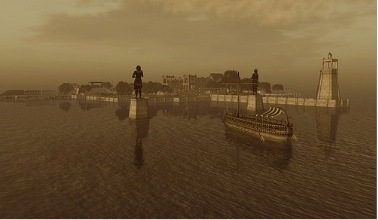 However, the island areas are beautiful builds and there is a lot to see and explore. However, the better boats in Sl are two-parts: the main hull and the attachable "detail" portion, built this way to get around the 32-prim limit on moving vehicles. This problem is most pronounced if I sail up to an island in Blake Sea - I cannot "stand-up" (I am "sitting" on my boat) - because the detail portion of the boat will detach from me and the boat will try to rez another. But it's a no-rez zone. Fail. 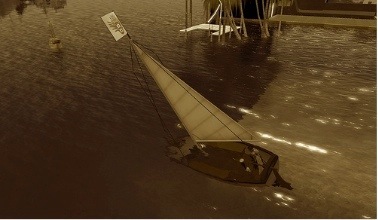 So I often go cruising the shorelines of mainland seas and lakes looking for that one or two parcels that allow rezzing and have enough prims for me to rezz my entire boat. Then I go coast-skimming on my sight-seeing tour. Unfortunately, some regions - those water or shoreline regions can be a problem. 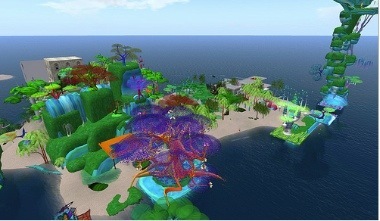 As a rule, Linden Lab includes an openspace region next to shoreline regions as an "ocean-buffer" - but sometimes they don't. Part of the challenge of sailing coastlines comes in navigating those areas where residents use every inch of land "space" they have, even when they don;t need to. As I sail from my berth in Neobelow and make my way to the Blake Sea and back, there are a couple of challenging spots. But fortunately there is just enough room to squeeze even my huge Frigate through. Kind of like a micro-Suez-canal. This one bridge is blocking my access to the entire northern half of the continent, spoiling everything. I mean, c'mon! Do you really have to build right to the very edge of the world? 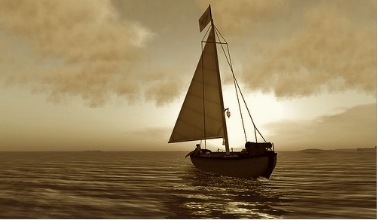 You obviously don't sail or own a boat in Second Life, do you?